Elecampane has been considered a cure-all and particularly useful herb since ancient Greek and Roman times for treating common colds, menstrual disorders, digestive upsets, and dropsy. It is especially regarded as a tonic herb for the respiratory system by European, Chinese, and Ayurvedic medicines. It effectively treats chronic bronchitis, bronchial asthma, colds with copious clear or white mucus, and irritating coughs (especially in children). Traditionally it was used to treat pulmonary coughing associated with tuberculosis. Below is an overview of Elecampane (Tu Mu Xiang, Xuan Fu Hua, Jin Fei Cao), combining and interpreting the best of Western Science, Traditional Chinese Medicine (TCM), Shamanism, Folklore and more. Gain a balanced and thorough understanding of the healing properties of Elecampane (Tu Mu Xiang, Xuan Fu Hua, Jin Fei Cao). Key Western Actions & Medicinal Uses: Expectorant, Antitussive, Antibacterial, Sedative, Anthelmintic, Diaphoretic, Stomachic, Antifungal, Antiparasitic, Relaxant, Warming, Tonic, Alterative, Diuretic, Antifungal, Carminative, Gentle Stimulant, IN large doses Emetic. Common cold, chronic bronchitis, whooping cough, asthma, pleurisy, digestive disorders, menstrual cramps, sciatica, dropsy, worms (including: roundworm, threadworm, hookworm, and whipworm), distention, nausea, vomiting, diarrhea, angina pectoris. Meridians: Root/Tu Mu Xiang – Lung, Liver, Spleen, Stomach. Flower/Xuan Fu Hua – Liver, Lung, Stomach, Spleen. Key TCM Actions & Medicinal Uses: Root/Tu Mu Xiang – Builds Qi/Restores the Lungs: autoimmune diseases, exhaustion, daytime sweating, weakness, palpitations, chronic cough, bronchial asthma, coughing up copious white or clear sputum. Dissolves Phlegm from the Lungs and Stomach: cough with sputum, bloating, diarrhea, loss of appetite, rattling in the chest. Strengthens the Spleen and Stomach/Moves Qi: distension, bloating, full feeling and pain in the chest or abdomen, nausea, vomiting, diarrhea. Stimulates the Liver and Uterous: menstrual cramping, constipation, jaundice. Dredges the Kidneys/Releases Toxins: irritability, painful scanty urination, headache, edema. Used to treat cholera, malaria, and dysentary. Flower/Xuan Fu Hua – Redirects Qi Downward/Expels Phlegm: wheezing, congestive fluid disorders with copious sputum. Stops Vomiting/Calms Rebellious Qi: nausea, vomiting due to cold deficiency in the stomach or spleen. Its leaves are similar to the downy soft leaves of mullein. Its flowers look like small sunflowers, about 4 inches in diameter and bloom from mid to late summer. The stems are deeply furrowed and rise from a basal rosette of large, ovate, pointed leaves. The lower part of the stems are hairy becoming sparsely branched and downy towards the top. The plant can grow to be 3-6 feet tall. Elecampane is found throughout Great Britain, Europe, the temperate zones of the west Himalayas, and eastern and central North America. It likes damp meadows, well-drained loamy soil in damp, partly shaded environments. Flavors/Temps: Root – Bitter, Acrid, Warm. Flower – Bitter, Acrid, Slightly Salty, Warm. Caution: Considered safe, though a few people may have an allergic reaction. High doses can cause vomiting and nausea. Not recommended during pregnancy and breastfeeding. History/Folklore: The key to elecampane is its ability to clear mucus from the lungs, bronchial tubes, sinuses, liver, and digestive tract. It therefore treats the full range of phlegm disorders in the respiratory and digestive systems, including the liver. Conditions include: chronic bronchitis, nausea, gallstones, and diarrhea. Compared to other popularly used Western herbs, elecampane is most similar to what is known in Oriental medicine as a “Qi tonic.” The herb tonifies the lungs, digestion, heart, liver and kidneys, making it an excellent example of a true Qi tonic. Elecampane is an excellent herb for treating long term respiratory ailments such as asthma or chronic bronchitis. Traditionally it was used to treat pulmonary tuberculosis and emphysema. It strengthens the lungs easing coughing and wheezing. It is an excellent lung tonic for those who are prone to asthma. The longer you use it the better it works, it is a tonic herb and it works slowly and steadily. Small daily doses are all that is needed. It is known for penetrating to a person’s core to heal, lift the spirit, and open the lungs. Large doses can cause nausea and vomiting and are not necessary. Small doses are all that are needed of this powerful, effective, and penetrating herb. Elecampane blends well with mullein and licorice to help clear the lungs. If a person is especially weak in the heart and lungs combing elecampane with hawthorn, used long-term can make all the difference in a person’s recovery. It is a good herb to use when cleansing action is needed, especially the removal and dissolution of phlegm from the body. The flowers and the roots have similar properties and taste, though the flowers can also tend to be slightly salty and the roots are not. In Oriental medicine, the flowers are also viewed as being more moving than the roots. They are used to help move energy and phlegm downward. The flowers are considered to be especially helpful for treating nausea after chemotherapy. Traditionally in China, the flowers were steamed and dried. Today they are fried in honey. This is done by soaking the flowers with honey that has been thinned by adding water and then baking or frying the prepared flowers over moderate heat until they are no longer sticky. Herba Inulae/Jin Fei Cao, is the name of the aerial part of the plant, used in China to warm, transform phlegm, and stop coughing. While similar to the flower and roots in actions, it is used to treat more superficial problems. It is considered salty, slightly bitter, and warming. In Oriental medicine, besides using the roots in teas, decoctions, washes and extracts, a preparation of the root is also made by dry-frying or baking the root until it is yellow, this moderates the acrid taste of the herb and improves its ability to treat diarrhea and nausea. Good quality roots are large, intact, with a golden tinge and thin white hair. The Chinese also make use of the bitter leaves and stalks. These are considered to have strong diuretic properties, helping to move pathogens and phlegm downward and out of the body. In contrast the flowers are better for expectorating phlegm upwards and out and relieving cough. Research in China confirms the herbs antibacterial properties as well as confirming its stimulating effect on the nervous and digestive systems and the adrenal cortex. The constituent inulin, is a phytochemical that both coats and soothes bronchial passages as well as works as an expectorant helping to reduce the flow of phlegm associated with chronic bronchitis or bad colds. Elecampane contains the richest sources of inulin compared to other herbs. The amount of inulin available will vary per season, with the levels being the highest in the fall. The constituent alantolactone is known to have expectorant, secretolytic, antitussive, antibacterial, and antifungal properties. It is also the substance that helps rid the body of intestinal parasites. The sesquiterpene lactone constituents in elecampane have been shown to have potent healing, antiseptic, and relaxant properties that contribute to the herbs ability to treat coughs, colds, and bronchitis. The plant’s bitter qualities supports its action as a stomachic. The bitter taste stimulates the appetite and improves digestive function. The roots are thick cylindrical branched rhizomes that are yellow on the outside and white on the inside. They give off a scent that is similar to blooming violets. The roots can be distinguished from belladonna, dandelion, and marshmallow, by noting the presence of oil-glands. None of these other similar roots contain oil-glands. 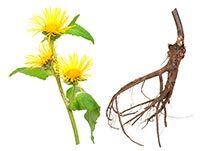 Elecampane roots are also not starchy (belladonna roots are starchy) and lack any kind of well-marked radiate structure in the wood dandelion and marshmallow both have clear radiated structures (marshmallow) or ringed barks (dandelion). The roots can be used to help menstrual cramping due to estrogen and progesterone insufficiency, including delayed scanty menses. Typical dosing for the dried root used in decoction is 1.5 – 3 g taken 3x daily, in liquid extract (1:1 in 25% alcohol) of 1-2 ml taken 3x daily, in tincture (1:5 in 25% alcohol) of 3-5 ml taken 3x daily. For a cup of tea made from the root 1 tsp to 1 pint of boiling water can be taken 2x daily. Elecampane essential oil is also used to boost the immune system, prevent bacterial and intestinal infections, improve digestion and support proper lung function. Elecampane essential oil is one of the few essential oils that is also prescribed by doctors. Studies have clearly shown the effectiveness of this essential oil to support the lungs, aid digestion, build immunity, and prevent infections. It is also used to help pregnant women suffering from water retention and as an aid to rid toxins from the body through urination. In Tibet, the oil is blended with ginger and used to prevent constipation that can lead to constipation-related cancer. The herb is used to enhance psychic abilities and was used in ancient times as part of a blend to protect against witches. In Medieval times the herb was one of the main ingredients in a digestive wine known as “Potio Paulina”, named after St. Paul’s suggestion to use a little wine to ease stomach aches. A cordial used to be made by infusing the root with sugar or honey and blending this infusion with currants in a port wine. This was enjoyed as an aid to digestion. It was grown in all private herb-gardens as both a culinary and medicinal plant. The roots used to be chewed by travelers when passing near polluted waters to protect against noxious substances. Legend says that the name Inula, comes from Helen of Troy whose tears are said to have turned into the healing plant we know as elecampane. Hippocrates, “the father of medicine,” said that elecampane stimulate the brain, kidneys, stomach and uterus. The Druids used the herb as an incense in rituals for initiation and blessing babies. The Spanish used to use the herb in surgical dressings. Elecampane is used as a flavoring agent in digestive liqueurs, vermouth, absinthe, cough syrups, pastilles, and candy. It is also used as a fragrance for cosmetics and soaps. It can be used to make a blue dye. Inulin, Quercetin, Mucilage, Volatile oils (Including: Helenin, Camphor, Alantol), Alantonic acid, Thymol dericative, Sesquiterpene lactones (Including: Alantolactone, Isoalantolactone), Triterpenoid saponins, Sterols, Bitters, Resin, Pectin, Alkaloid. The roots are popularly used to make cough drops and lozenges to ease asthma, and even candy. Elecampane is used in veterinary medicine as an effective remedy for skin diseases of sheep and horses, hence the common names: horseheal and scabwort. The constituent alantolactone is known to have anthelmintic properties making it effective for treating roundworm, threadworm, hookworm, and whipworm infestations.